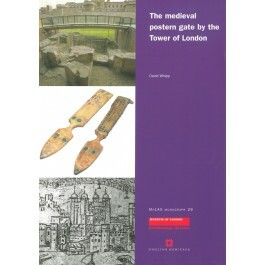 This long-awaited publication elucidates a remarkable monument, now preserved in situ beside the Tower of London. Excavations at Tower Hill in 1979 uncovered substantial reamins of the medieval postern gate at the junction of the City's defensive wall and the moat of the Tower of London. The postern gate was constructed between 1297 and 1308, towards the close of the reign of Edward I. It formed a defensible terminus to the City wall and a minor gateway suitable for pedestrian traffic. The base of a rectangular tower survived on the south side of the gate passage, along with a staircase turret. The structure had a cellar and a ground floor chamber with a suspended timber floor, the superstructure surviving to the level of the arrow loops. The tower must have had at least one upper floor. These remarkable remains survived because of a dramatic landslip in 1431 or 1440, when the southern part of the structure slipped at least three metres down the side of the moat. The northern part of the gate probably remained standing whilst the underpinned southern tower provided the foundation for a rebuilt postern gate. Cartographic evidence shows that a postern gate stood on the site until at least the 17th century. Thematic aspects include documentary evidence that the gate was administered by the City rather than the nearby royal castle, the question of whether there was a Roman gate in the adjascent city wall, the appearance of the gateway and the character of the Tower Hill area in the 16th and 17th centuries.